NITS conducts a large variety of programmes on various subjects at its facilities at Noida campus as well as at its training centers in Chennai, Kolkata, Mumbai, Bangalore, Bhopal, Hyderabad and Jaipur. 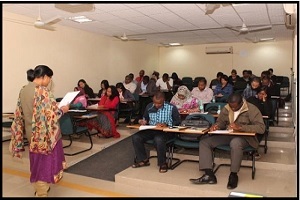 These programmes form part of NITS Annual Training Calendar and identified as ‘On-Campus Programmes’.<br`/> In addition to the ‘On-Campus Programmes’, NITS also conducts similar programmes or customized programmes on these and related subjects on specific request of client organizations at their premises as ‘Off-Campus Programmes’. Lead Assessors Courses on Quality Management Systems (as per IS/ISO 9001),Environmental Management Systems (as per IS/ISO 14001),Occupational Health & Safety Management Systems (as per IS 18001), Food Safety Management Systems (as per IS/ISO 22000), etc. Awareness programmes/ Documentation for QMS, EMS, FSMS, OHSMS, EnMS, etc and Integrated Management Systems. Training for implementation of Service Quality by Public Service Organizations as per IS 15700. Training for Internal Audit for QMS, EMS, FSMS and for Integrated Management Systems. Training programmes for Laboratory Quality Management Systems (as per ISO 17025) and Medical Laboratory Quality Management Systems (as per IS/ISO 15189). Training programmes on Measurement Uncertainty and Inter Laboratory Comparison and Proficiency Testing. Training Programmes on Certification Procedures for BIS Applicants. Training Programmes on Product Certification Marks Scheme for Licensees. NITS is one of the training institutes identified by Ministry of External Affairs, Govt. of India under Special Commonwealth African Assistance Programme (SCAAP), Indian Technical and Economic Cooperation (ITEC), Colombo Plan (CP) for developing countries. NITS has been conducting these programmes to developing countries of Asia, Africa, Europe and Latin America every year since 1968. Organizations that are implementing (or are in the process of implementing) QMSIS/ISO 9001, EMS-IS/ISO 14001, FSMS-IS/ISO 22000, OHSMS-IS 18001, EnMS- IS/ISO 50001 or SQMS-IS 15700 in their organizations require trained personnel in this area, preferably Lead Auditors/Internal Auditors for effective implementation of the system. 5-dayAccredited Lead Auditors Training Course and/or 2 Day Internal Auditors’ Training Course in various Management Systems can prepare them to undertake auditing in the respective areas. Organizations that are implementing (or are in the process of implementing) QMS-IS/ISO 9001, EMS-IS/ISO 14001, FSMS-IS/ISO 22000, OHSMS-IS 18001, EnMS-IS/ISO 50001 or SQMS- IS 15700 in their organizations require to train their personnel in such areas, preferably Lead Aditors/Internal Auditors for establishment and effective implementation of the system. Often the organizations require training courses on various Management Systems for their officers/staff at their premises. NITS cater to these requirements by imparting the training at the premises of the clients on request. Some of the prestigious clients of NITS for such programmes include Air-India, Indian Railways, Cabinet Secretariat, NPC, NHPC, NTPC, HAL, BSF, Indian Air Force, Ordnance Factory, Customs and Central Excise, DGCA, Postal Department and many more.